Elixia is a perfomance skincare range that was developed on the strength of 10 years worth of scientific research from Phosphagenics Limited, an Australian biotechnology company. 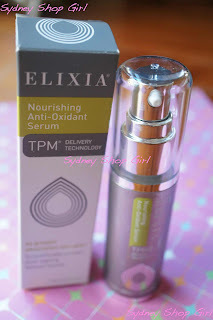 The unique property of Elixia skincare is TPM Delivery Technology, a Vitamin E derived system that facilitates deeper delivery of key ingredients into the skin. In addition, Elixia products are free of parabens, formaldehydes. sulphates, SLS, SLESs and DEAs. One of Elixia's most awarded products is BodyShaper, a cellulite treatment cream that retails for $99 (150 ml). BodyShaper has been shown (in a consumer study) to reduce the appearance of cellulite by 40% over 21 days with women noticing smoother and more defined skin over their legs after 28 days of use. 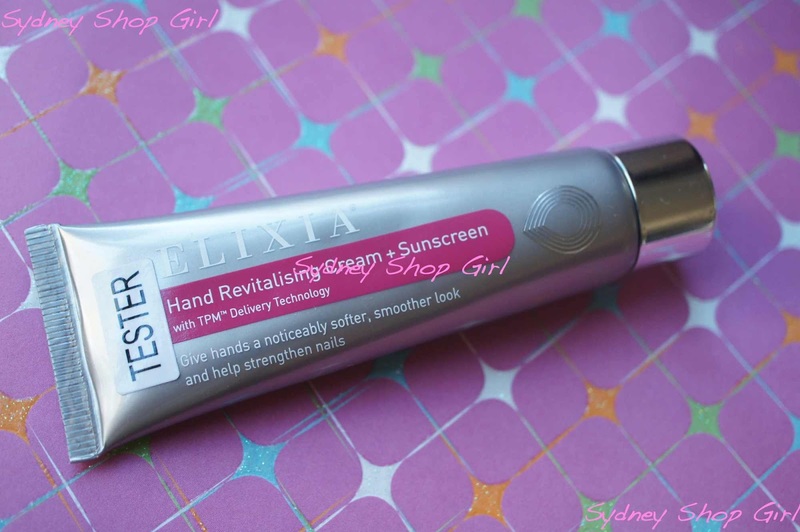 Phosphagenics got in touch with me a few weeks ago after coming across the blog and asked if I was interested in reviewing a few products from the Elixia range. Not only am I in denial about cellulite but as BodyShaper contains retinol, Phosphagenics advise that pregnant women refrain from using the cream for the duration of their pregnancies. There are two skincare ranges currently available, the High Performance and Natural ranges. High Performance products aim to deliver results within 28 days and work on issues such as expression wrinkles, fine lines, puffiness and dark under eye circles. The Natural Anti-Ageing range nourish and hydrate whilst preventing the visible signs of ageing. Phosphagenics was kind enough to supply me with products from both ranges and I've been trialling them over the last week. $69.95 AUD for 10 ml. Aims to smooth, reduce dark circles and under eye bags. Fragrance free and suitable for all skin types. Can be reapplied any time of the day as required. 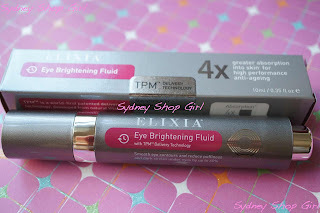 The Eye Brightening Fluid had a light texture that sunk easily into the skin around my eyes. It's untinted and can be worn under makeup during the day. I've been applying this twice daily and haven't needed to apply any touch ups at all during the day. I was especially impressed with the applicator system. 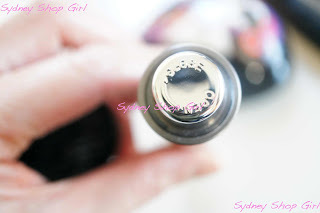 The liquid is applied directly from the tube via a roller ball mechanism. To release product, all you need to do is unlock the base and press the button once to release a generous amount of liquid. An easy to use eye treatment that wears well during the day. Very soothing to the skin around my eyes. Discolouration and puffiness has been kept at bay whilst using the Eye Brightening Fluid. I do look well rested (the combined effects of cutting edge skincare and a long break from work will do that to a girl). $59.95 AUD for 30 ml. A multivitamin serum for the face which also contains natural botanical oils. To be used twice a day alone or in combination with other Elixia products. The serum is packaged in a pump pack. Whilst light in texture, I found it very emollient and more moisturising than other serums I've used. It could well be used on its own during the summer. Left my face feeling plumped out and hydrated. In the warmer weather, I'd be able to wear this alone at night. Contains sunscreen as well as almond oil for cuticles. Targets hyper pigmentation and skin ageing. This is a lightly textured hand cream that didn't leave any residue behind after application. I do have quite dry hands though and wash quite frequently with antimicrobial, alcohol based products because of work. For this reason, I'm reserving this hand cream for use at home or on the weekends when I'm not at work. I do like the added benefit of sunscreen in a hand cream though, I tend to neglect this fact in my daily hand care routine. I like that Elixia has based its product development on both scientific and consumer based research. The product range targets the complaints many people have with regard to their skin. The packaging and information provided with each product are both well thought out and make using the range easy. The official website is very informative and well designed. Considering the production values that go into Elixia skincare, I felt that the prices are fair. I'm so getting myself a tube of BodyShaper after Baby SSG enters the world! Thanks again to Phosphogenics for providing the products for this review.